Ever get the impression that no one is listening to your brand messaging? Imagine a room full of people all talking at the same time. You weave your way through the crowd unable to focus on any of them because they all seem to be saying the same thing. That’s what your clients are thinking when they’re searching for the services that you offer. Compare your business to your competition. You’re just another clone. You’re standing on the same soapbox, saying the same thing, and what you’re saying really isn’t that interesting. You were going to be different. When you opened your business, you knew what you wanted to say and you came out of the gates with gusto and whit. But that was a long time ago, in a land far, far away. Your branding doesn’t seem to shine as much these days. Your message doesn’t have that energy it once had and you’ve noticed your competitors are now using your talking points to promote their own work. How did this happen? Why isn’t it working? You knew what your clients wanted. Every customer would react the same. You had to please them all. Every customer knows what makes your product different. Assumptions are necessary or we would be paralyzed with inaction. Unfortunately, as marketing expert Dany Iny teaches in this article on ThinkTraffic, those assumptions become the base of your branding platform and translate into your marketing; your website, print material, and social media campaigns. I’m sure you’ve already noticed it and tried to fix it. Sweeping changes were needed. You tried new talking points and probably had to find a better way to communicate your thoughts to your clients. At first you made minor adjustments, ones that you could do yourself with minimal costs. You tried a Facebook campaign and made monthly or even daily changes to get the perfect pitch. When you realized that your efforts played out like a failed movie script requiring more edits, you tried experts, so called specialists with authority who knew what they were talking about. They said you had to change your scheme and override with flashy ads and pricey campaigns. And yet, it still didn’t work. Are you ready to pull out your hair? What is the answer? The goal of branding is to differentiate yourself from the competition, to build a taller soapbox, start speaking a different language, to resonate more with your target audience. Try looking at the problem from a different direction. Think of your business like a movie or a novel and realize there are good ones, that truly resonated with their audience such as the Titanic which grossed $2,207,615,668 worldwide or the novel version of The Davinci Code with over 5 million copies sold and there are disasters like Mars Needs Moms which lost $130 million. 1. Who’s Telling Your Story? Who is the main character anyway? Perspective is an amazing thing. In every story, whether it’s a movie or novel, there is one protagonist. It isn’t always the hero, but at least someone whose perspective will add to the conversation and keep the story relevant. A weak protagonist won’t engage your audience and they will become distracted. With a compelling perspective for your brand, you will establish a rapport with your clients as they imagine themselves in your footsteps. A single perspective will teach your team to add value through their own interactions with your clients and on social media so they reinforce your message and keep your audience engaged. 2. What Makes A Good Story? By using these 8 elements of storytelling in your branding, you make your story more cohesive, compelling, and believable. Each element lends to the next, stacking on until your story naturally leads to its conclusion. You can then use the 8 elements to break down the plot and give your brand a narrative that draws an audience in to cheer for your brand. So caught up in the story, they will gladly open their wallets to secure the ending you have painted for them. 3. What Is Your Focus? Ever notice that some stories are just bloated? You try to keep up with all of the characters, but there are so many that you can’t tell the difference between them. A great story has only a few different plots, and even then there is only one main plot. The story stays focused to keep the audience engaged. When it comes to your branding, try a simple story that compels your audience to ask, “What’s next?” Keeping them on the edge of their seat will be far easier with a single plot than violently forcing them to follow one after another. 4. Do You Know An Editor? There are many types of editors, developmental, content, and copy editors. Each have their purpose. Developmental editor: More like a coach, this editor ensures the big picture progress is made. Content editor: This editor ensures your content is cohesive and you haven’t made an adjustment in the beginning that negates the end. They keep your voice consistent as well. Copy editor: Grammar, rhetoric, and a few facts along the way, the copy editor makes sure that your work is readable. Possibly the most important editor, they make sure that your article or branding make sense to you audience. A few mistakes in your brand marketing are usually overlooked, but the same can’t be said for a sloppy message because you were unwilling to hire an editor. 5. Who Doesn’t Love A Sequel? Any good story leaves the audience asking for more. The audience revisits the characters in their minds for days, imagining what was next. And sometimes, the audience is rewarded with a sequel as the writer delves back into the world they’ve created. Try leaving an open loop with your branding. What would Apple have done if they stayed with computers alone? And where would the world be if G.E. was still only making light bulbs? How Does This Work For Me? Crafting your brand strategy as a story engages your audience on a higher level. They will root for you, wishing for your success and the small nuances will reinforce their views of your brand so when it’s time to buy, they won’t look elsewhere. They will look to you like the dog-eared classic they pull out for comfort and direction. My editor had a truly inspiring exercise for me that I ask my clients to use now and then. Imagine two people in a room. Put yourself inside the head of the one on the left during an argument. What is going through their head as the scene plays out? What are they thinking as the other person screeches like a banshee? Now, do the same for the other character. What was the second person thinking during the exchange? Explore the differences of opinion and observation that each has with the same situation. Keep this in mind as you craft your brand story so you can affect how your audience experiences that story. Once you have an idea of how your audience will react, move on to the elements of storytelling. Every story doesn’t have to be epic, only compelling and engaging. Focusing on the message makes it clear and concise so your audience knows what their next step is. And finally, always be thinking about your next interaction. What is the next step for your brand? Are you looking to expand or keep the status quo? What about you? Who’s the hero of your brand story? Building on almost two decades of small business experience, John Kent is a former financial industry insider who offers business coaching to new entrepreneurs at Business Plans Profit. Check out his blueprint for new businesses there. His novel, Orphan Station, is available on Amazon. When we are portraying something it should not be like marketing. First we need to engage with the people, then we need to start conveying through casual discussions, that is the business secret. 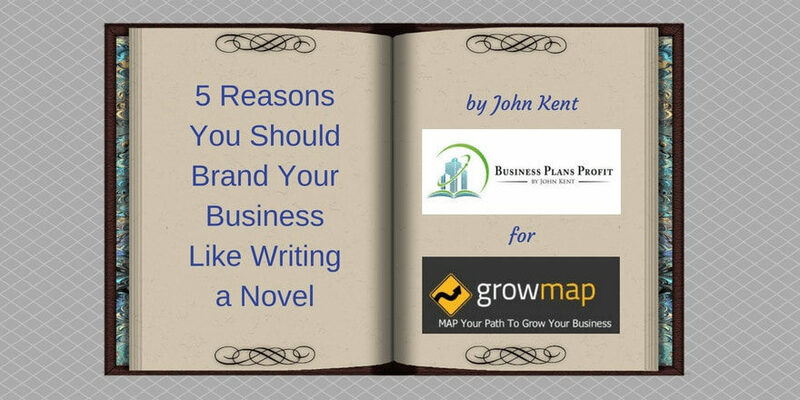 I have gone through your article 5 Reasons You Should Brand Your Business Like Writing a Novel. It is very useful for those struggling to brand their business. This Article will surely helps to them. I appreciate your complement. The element of storytelling can be very powerful for your business. Good luck. [ Smiles ] Most bloggers that I know edit their own work. Outsourcing an editor is a very strange concept for me. However, I found this article of yours to be most enlightening! Every writer can benefit from having someone else at least proofread their work. It is so easy for our eyes to just pass right over small errors. If you must proofread your own work, read it out loud. You will catch more mistakes that way. Editing is another level of better writing that most of us aren’t currently utilizing except for critical content. Thanks for taking the time to comment. While I don’t send my blog articles to my the editor I use for my novels, I do like to have someone check my work. I’ve even noticed mistakes on my second or third reading that my editor missed. No one’s perfect, but I find that sometimes an editor can make your work feel that way. And additionally, another set of eyes can see your point from a different angle and offer a counterpoint before it goes live. Knowing and acknowledging the arguments against makes your work that much stronger. I admit that there was a time that I questioned why one would focus on branding, but now, I can see how the pieces stack together like building blocks. Establishing your branding message will even help create your business plan as you define who and what you are. Its Good to read this knowledgeful article………. Thumbs up to you ! Branding is the first part of a much larger conversation about who and what your business is. By defining your brand, you can define what your next steps are to engage your audience where they are most comfortable. Here is Lots of great information and inspiration. I would like to say thanks for your great efforts with this article. I appreciate your excellent blog post. Thank you so much. I truly believe that a strong branding plan will define your business so you can engage your audience. Thanks for sharing some eye opening concepts John! business owners, and or service providers find themselves in! And continued success with your book! I am glad I could be of help. I envisioned a chorus of singers when I first thought about the soap boxes, all singing in unison, or rather almost. It’s disconcerting for an audience and eventually they pack up and go home. With a shift, especially for Millennials using more mobile and less face to face, we need our brand message to be concise. This is an interesting approach to branding, we’ve been recently going over a major rehaul of our brand so we are looking for any ways to improve. Thanks Peter, I’m glad I could give you a new perspective. What’s your biggest struggle for your branding? I love the idea of comparing a blog post with the novel. People brand their business like writing a novel. Though it’s quite hard to notice but they still do. All the phases from start till the end, the business promotion requires them. It’s important for a writer to know what the readers want. The same thing goes with the clients in any business. Ravi Chahar would love you to read ..How To Become An Expert In Your Field With Power? Thank you. Sometimes it takes a different perspective to recognize the similarities between things. I have always tried to consolidate my novel writing with my business advice, but then one day it hit me how similar they were. Good article! you have good and nice information Thanks for sharing such a amazing article with us. What’s your favorite part of branding? I love story and leading my clients from one place to another. If you are subtle enough, your audience will feel like it is a perfect conclusion. You can create a brand champion in them so they do your marketing for you. The most innovative entrepreneurs look outside of their markets and beyond their competitors. They don’t work within traditional boundaries or allow themselves to be confined by precedent. They search for new product, marketing and sales ideas across a wide variety of fields. They differentiate themselves from the competition and reap their just rewards. Authors and entrepreneurs both tend to have big egos. We think we’re important enough to have something to say or to change the world. But the fastest way to making real impact is listening, not talking. Eventually, thanks for sharing your worthy interesting thought with us. You are so correct. If Red Riding Hood had nothing else to teach us, it’s to have two big ears to here you with. If we as entrepreneurs exercise a bit of patience and take the time to learn what our audience wants then we can have a much bigger impact. Storytelling is one of the ways that makes a blog post great, love how you the way you’re telling a story but I usually put up a story from experiencing and tell it from by the heart. Passion begets empowerment when writing. I find if your first draft is told from the heart, it will have great passion. Then you can go back later and edit for structure and continuity. In what spare time I have, I farm. There are many life lessons to be learned from farming that can apply to entrepreneurship. Where do you draw inspiration? Excellent comparison John!! Love your 5th point. What we need is to make our audience to ask for more. Its depends on the quality of the products/services we offer. I love setting up a marketing plan to leave room for more. Not only does it give you the ability to pivot if things don’t work out well, it gives you room to ask your audience what they would like. You create a direct line to your customer base when they are engaged in your dialogue. Thanks for sharing information how write content in blog.yes john i agree with u .making same information about products and services different way help in attracting more visitors to website.once visitor came to website knowledge shared in website helps in converting visitor to customers. There is a lot of information in the market and much of it you can get from anyone, but sometimes all it takes is changing the way you say it. Experimenting with how you say it, and adding color from your own experiences will engage your audience. You become an icon for your audience to connect with as they experience their own roadblocks. Great post ! You are right, our prospects or services should be clear in our sites and at the same time answering all the queries of the customers means more engagement. That’s necessary for a startups business to prove them in the market as they are newbie. I appreciate the comments. I have to admit that it took some time for me to get the right message. I do a lot of things and to get a consistent message across them all is important as many clients overlap too.